22,442 people lost their lives serving in British units on D-Day and during the Battle of Normandy. 27 year old Sister Mollie Evershed and Sister Dorothy Anita Field, who was 32, were both nurses. They were serving with the Queen Alexandra’s Imperial Military Nursing Service. Today we’ll tell you Sister Evershed’s story. Christine Fuller went to the same school as Mollie, Ely High School in Cambridgeshire and has been researching the school’s history. Christine has discovered how the pupils were told about Mollie’s selfless sacrifice. After her death, Mollie’s parents received 75 letters of gratitude from the servicemen who she saved. Both Mollie and Dorothy are commemorated on the Bayeux Memorial to the Missing as their bodies were never recovered. 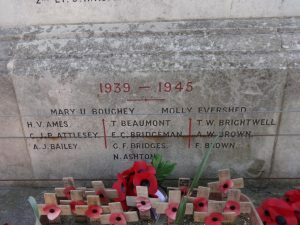 Mollie’s name is also remembered on the Soham war memorial. Soon, Sister Mollie Evershed and Sister Dorothy Field will be named on the British Normandy Memorial. Two heroic and inspirational women who will be remembered by generations to come.